Tessa Thompson, star of film and television, is probably just a regular human. Those of us who live in the gray tones of the normie world know this—we’re fine with thinking, “Hey, that human is a good actor. She’s in a lot of good movies,” and leaving things at that. But what if we’re missing a whole new world, hidden just beneath a surface layer of illusions? 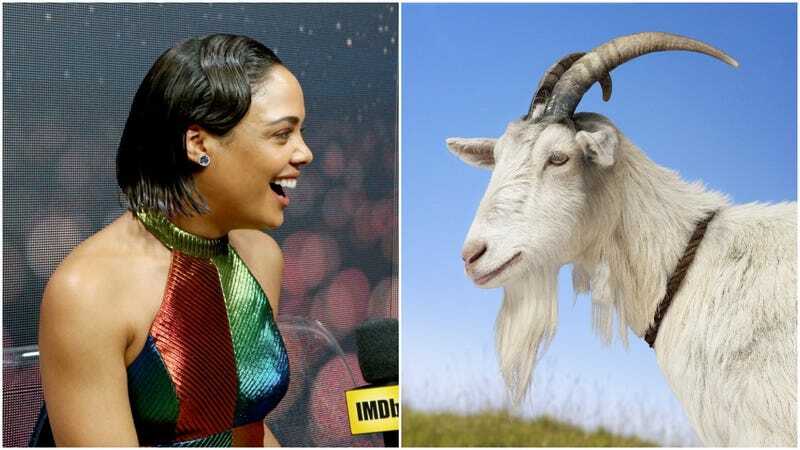 The concept is simple: the account loves Tessa Thompson and the account loves goats. It has, apparently, tapped into something deeply felt by many others ... and Thompson herself. Thompson herself is also way the hell on board, boosting the account with retweets and endorsements for the ongoing project. The entire thing seems simple enough: here is a celebrity and here are some goats that look like photos of this celebrity. But it also hints at something else. It suggests that maybe, just maybe, there are were-goats among us, doing everything from serving coffee at Starbucks and working as bank tellers to running governments ... and acting in our favorite films. Whether Thompson is one of these strange beings, shifting between goat and human as easily as you may change your shirt, is impossible to tell, but her willingness to celebrate this new Twitter trend suggests she may be trying to defuse her exposure by very publicly laughing it off. The star of Thor: Bahhhhgnarok and Aaahhhhhnnihilation protests too much, as if eager to hide a secret that hits a little too close to home.